In the last lecture I said that the Stoic treats conduct as the result of a practical syllogism, in "Which a particular act or object is subsumed under the idea of the good. But in order that such a practical syllogism may be possible, we must be able to obtain a clear definition of the good in general, and we must also be able to understand the particular case to which it is to be applied. The former is possible, because the idea of good is bound up with our self-consciousness, and only needs to be brought to light by reflexion and analysis. And I attempted in the last lecture to show how this task was performed by the Stoic and criticised the result to which he was led. In doing so, I partly anticipated the second question as to the minor premise in the practical syllogism—the question how, on Stoic principles, we are able to determine the nature of the particular things which have to be subsumed under the idea of the good. But we cannot do full justice to their theories until we have directly examined their answer to this question, and especially their thoughts as to the absolute or relative indifference of all outward things. First of all, then, let us ask how, according to the Stoics, we get knowledge of particular things. To this the answer is that our knowledge of such things is not, like our knowledge of the good, innate, but must be derived from sense. This, however, does not mean that the truth of such objects is immediately give» to us through sensation. It is true that the metaphor of 'impression' is taken literally by the Stoics, and that the outward object is conceived as stamping its image on the soul as a seal impresses itself on wax. At the same time this idea of the passivity of the soul in receiving impressions is partly corrected by the thought that the mind, in receiving the impression, is in tension against the object that impresses it, and grasps that object with more or less energy in the moment of perception. Now, knowledge depends just upon the firmness of this grasp. We are not to take all impressions as equally true or equally representative of reality. The impressions which we receive when the mind is feeble in its action and takes things just as they come, are vague and uncertain. But we are able, by directing the attention steadily and persistently to the object, to get images whose outlines are clearly defined, and which bear with them the evidence of their objectivity in the vividness and distinctness with which they present themselves. 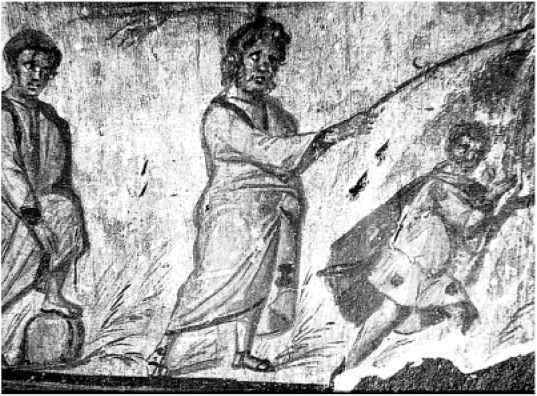 In Cicero's language, such images carry with them a peculiar and convincing testimony to the things they represent (propriam quandam habent declaroMonem earum quae videntur).1 Such a well-attested image is called a cpavracrla KaroX^irTLKTj, a phrase which has been interpreted in various ways. 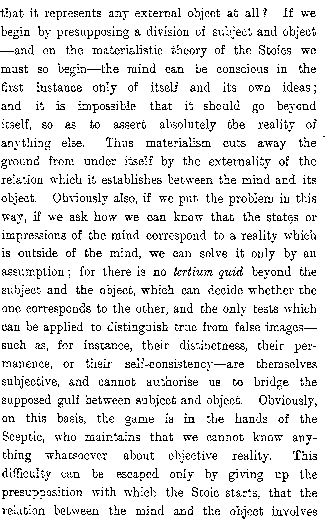 Zeller and others have taken it as meaning an image which can lay hold of the mind or is borne in upon it ; but more-probably it means a presentation or idea which grasps, or enables the mind to grasp the object as it really is.2 The sanity or strength of the mind, according to this view, is shown in Its refusal to commit itself or give its assent to any belief as to the object, until it has got a clearly defined and persistent image of it. Till we have compassed such an image, we ought to withhold our judgment ; but when we have attained it, we have a right to take it as representing reality. The (pavraa-la mrakrjirTiK.^ is therefore declared to be the criterion of truth; in other words, it is declared to bear with it its own evidence, and to be in its turn a touchstone for other ideas which are less distinct. 2 Zeller, III, 1, p. 72 (2nd ed. ): Bonhoffer, p. 160. It is easy to see that we have here a very naïve and elementary consciousness of the difficulties which stand in the way of scientific knowledge. Accordingly the Stoics were greatly harassed by the objections of the Academics, who pointed out, on the one hand, that it is impossible for images of sense to be so clear and complete as to make deception impossible; and, on the other hand, that very clear and complete images often impress themselves on our minds, which yet cannot be supposed to correspond to any objective reality. Further, they pointed out that there is a great risk of misinterpretation entering into the process whereby we form a definite image of any object out of the data of sense—a risk which the simple theory of the Stoics hardly recognises at all. the physical externality of the one to the other. We then see that the real question is how the division of subject and object actually arises in our experience. For it must arise in our experience, if it is to exist for us at all; and, so arising, it cannot be an absolute division, or a division in which the object is spatially external to the subject. It cannot be a distinction between our experience and something else which, ex hypothesi, cannot come into that experience. Now, with the Stoic, this careful looking into the value of outward things ends always in the discovery that they have little or no value. " When we have meat or eatables of any kind before us, let us grasp the images of them firmly, and say to ourselves: This is the carcase of a fish, and this of a fowl or a pig; and again: This Falernian wine is only a little grape-juice, and this purple robe is nothing more than sheep's wool dyed with the blood of a shell-fish; for, when we thus represent things to ourselves, we penetrate to their inmost nature and search through all their relations so as to realise 1 Comment., Ill, 11.
exactly what they are. So ought we to deal with our whole life, and whenever imagination presents things to us as specially worthy of admiration, we should strip them bare and discover their cheapness, setting aside all the fine names by which they are exalted to the skies. "1 Again: "Decay is in the material substance of all things; they are but water, dust, bones, and stench. What is marble but knobs of earth; gold and silver but sediment; raiment but tags of hair; purple but the blood of the shellfish? Even the breath of life is no better, ever changing from one to another. "2 " Little value wilt thou set upon the delights of music, if thou wilt but decompose the melodious sound into its component notes, and ask thyself as to each of them: Is it this that overpowers thee ? Thou wilt be ashamed to confess it. The same result will follow the analysis of dancing or athletic exercises into the movements and postures which constitute them. In short, setting aside virtue and virtuous acts, thou hast but to carry out this method of dissection of things into their elements, and the result will be contempt for them all. "3 Above all the ' bubble reputation ' is to be reduced to its true value by reflexion on its exact meaning. "He who is greedy for fame perceives not that of: those who remember him every one will soon be dead: and so in due , course will it be with each of their successors till the last flicker of memory, 1 GommM., VI, 13. 2Id., IX, 36. 3 Id., XI, 2. The object of this close scrutiny is, of course, to reduce all finite and changing things to their proper finitude, that is, not to let them bulk too largely or assume to themselves any absolute value. Wealth, honour, health, sensual and aesthetic pleasure, domestic affections and bonds of friendship, and even life itself, every one of them is to be reduced to what it is in itself, and its limited scope is to be recognised. For thus alone can we be in a position to compare it with the good, and see what is its relation thereto. And the ultimate result at which the Stoic aims is to dis-illusionise us, and make us reject the idea that anything external is essential to the good of a rational being, or can have more than a relative value for him, if it has even that. With this is connected another thought, which points in the same direction, namely, that things external are mainly gifts of fortune, and that no effort 1 Comment., iv, 19.
of the individual can make them secure. To place our happiness in them is, therefore, to fill our mind with disturbance and anxiety, which he alone can avoid who fixes his interest and desire upon the things he can control, that is, upon the thoughts of his own mind and the acts of his own will. This thought is specially emphasised by Epictetus, who puts it in the forefront of his Manual of Ethics, as the lesson which of all others is most important for the guidance of life. H Of things that exist, some are in our own power, some are not in our own power. In our own power are opinion, will, desire, aversion, in a word, whatever are our own acts; not in our own power are the body, property, reputation, political authority, in a word, whatever are not our own acts. And the things that are in our own power are naturally free, not subject to restraint or hindrance; while the things that are not in .our own power are weak, slavish, subject to restraint, alien to ourselves. Remember, then, that if you think the things that are-by nature slavish to be free, and the things alien to yourself to be your own, you will be obstructed in your efforts, you will ever be in sorrow and disturbance, ever blaming gods and men; but if you think that only to be your own which is really your own, and that which is alien to be alien, no one will ever be able to constrain or hinder you. Tou will blame no one, you will accuse no one, you will do nothing against your own will; no one will be able to harm yon, and you will have no one for your enemy. If, however, you do aim at such high objects, remember that you cannot hope to attain them with a divided will, but only if you dismiss all other aims, abandoning some of them once for all, and setting aside the rest of them at least for a time. For, if you attempt to attain both kinds of goods, both those higher ends and such objects as wealth and power, you may probably lose the latter because you seek also the former, and in seeking the latter, you will certainly lose the former, which are the most real sources of freedom and happiness. Practise yourself, therefore, in saying to every threatening appearance: ' Tou are but an appearance, and not the reality you pretend to be/ Then weigh well each appearance by the rules of reason, and, above all, consider whether it relates to things in your own power, or to things not in your own power; and if it relates to anything not in your own power, be ready to say: ' Then it is nothing to me.'" In connexion with this we have to remember the religious point of view from which the Stoic starts in considering the events of life. The divine power which rules the universe, has, he believes, put into each one's hands everything that is necessary for his own welfare. "Whatever, therefore, it is not in our power to secure, must be regarded as unnecessary or indifferent. The things that are really mine, or important to me, are simply what I choose to think of and what I resolve to do—the inner movement of my mind, the inner determination of my will. In these alone lie good and evil for me. My will may be defeated in the effort to attain any objective end, and if I place my good or happiness in such ends, I am the slave of fortune. But no one can hinder me from thinking and willing what I please: no one can prevent me from determining myself in a right or a wrong way, however they may thwart the outward realisation of my will, or even fetter me so as to preyent any outward activity at all. But everything outside of the act of my will is to be regarded as indifferent, even the particular objects to which the will may be directed: for the essential good is simply the state of the will itself. We are apt to see something like folly and presumption in the Stoic pictures of the wise man, of his irresistible clearness of insight, and his impregnable strength of will: and, indeed, we cannot avoid doing so, if we suppose that the .Stoics meant them as descriptions of themselves. Horace's jests on this subject are well known. But we might almost as reasonably take Kant's "I can because I ought" as an assertion of his own impeccability. The Stoics believed that the ideal was realisable, and even that it x Epict., Man., § 19: DissertIll, 6.
had been realised in one or more of the sages of the past, such as Socrates. But it would be impossible to find a Stoic claiming himself to be the wise man, and Epictetus and Seneca and Marcus Aurelius tell us plainly that they have not attained. We are to regard such descriptions rather as exhortations, addressed by the Stoic to himself as well as to others—efforts of strong men to raise themselves above the chances and changes of mortal life to a consciousness of the better part that could not be taken from them. "What should we have in readiness in such circumstances ?" says Epictetus, speaking of the dangers to which good men were exposed under a tyranny like that of Nero, " What but this, to keep clear in our minds the distinction between what is our own and what is not our own, what is committed and what is not committed to us ? Suppose that I have to die! ,Am I then obliged to die lamenting? Suppose that I am to be imprisoned! Need I weep over my chains ? Suppose that I am to be banished! Can any man hinder me from going into exile with smiles and cheerfulness Such language seems somewhat overstrained, and would become absurd, if we took it as a profession of absolute indifference to the greatest calamities; but if we take it as the voice of a man, calling upon his fellows in the hour of danger to bear themselves nobly, or rebuking his own 1 Epiot., Dimrt, I, l.
and the Stoic also, in his own sense, could say with Luther that even if they all perish, "The «city of God remaineth." But, it will be said—though the Stoic may be right in treating most outward goods as infinitely less important than the maintenance of truth and inner integrity—is it not absurd for him to say that they are indifferent, if that means that they are of no importance at all; and this especially when under outward things are included, not only wealth, honour, and life, but also the fortunes and life of family and friends and all who are dear to him? To this it is at least a partial answer to say, that the Stoic, when he asserts that outward things are indifferent, does not mean that they are indifferent in every point of view, but only that they are indifferent as compared with the inward goodness of the will; for that which has a price, however great, becomes indifferent, when set against that which is priceless. The good will alone is an absolute good, and nothing can be measured in the same scales with it. You cannot weigh death against a bad action, or wealth and honour against a good one. In other words, you cannot by the summing up of finites reach an amount which you can set in the balance against the infinite ; for, so measured, the greatest possible collection of finites is the same as nothing at all. This thought throws light upon another doctrine of the Stoics, which is often misunderstood or treated as %n inconsequence. It has often been said that their doctrine of the indifference of outward things was so absurd, that they were obliged in the long run to get out of the impasse by making a distinction to which they had no right, between various kinds of indifferent things. They are accused, in short, of hedging before the difficulties caused by their own uncompromising statements. Unfortunately for this view, the doctrine that there is distinction of value between indifferent things, is not a qualification subsequently introduced into the Stoic system, but b©Jk>ngs to the earliest form of it. And I think we can see, on consideration, that it is a necessary part of that system. are only a very few things that are absolutely and from every point of view indifferent. The things that are naturally to be preferred are those that make for welfare in the ordinary sense—health' rather than sickness, wealth rather than poverty, honour rather than dishonour, the love of friends and kindred rather than loneliness and bereavement. All these things the Stoic grants to be naturally eligible from the point of view of our finite individuality: nay, he admits that, other things being equal, it is or may be, our duty to choose them. But, in regard of them all, he insists on three points: first, that they are finite e and transitory; secondly, that they are not in our own power; and, lastly, that, because of both characters, they are capable of turning into the greatest evils, if we attach ourselves to them as if they were absolute goods. In reference to the first point I have already shown how the Stoic is constantly arguing against the tendency to idealise finite things and treat them as if they were infinite. "Always remember," says Epictetus, " exactly to realise what each thing that attracts you is. If it is a piece of pottery you are fond of, say to yourself 'this is but a piece of pottery,' and you will not be greatly moved, when it is broken. ''1 This mode of estimating things as they really are is to be practised in regard to all our lan., §3. possessions, and we are constantly to recognise that even the highest of them, even the love of friends and kindred, is a finite and not an infinite good. We must love it, therefore, as finite and as transitory; for, as finite, it cannot fill the soul, and, as transitory, it cannot afford a support on which the soul may safely lean. And if we treat such things as absolute goods, the really absolute goods which alone are in our power—the unclouded vision of truth, the pure energy of righteous will—must escape us. The Stoic, therefore, while admitting that these things are in themselves eligible, counsels us to be continually realising to ourselves their limited value and our uncertain tenure of them; and sometimes, for discipline's sake, or as a counsel of perfection, he would have us turn from them altogether. do so with respect to wealth: and so you shall one day be a worthy partner at the banquet of the gods. But if you take none of the things set before you, and even despise them, then you will be not only a fellow-banqueter with the gods, but a sharer of their dignity; for by so acting Diogenes and Heraclitus deserved to be called, and to be, divine." Or, take another passage,1 where he says: " As on a voyage when the vessel has reached a port, and you go out of the ship to get water, it is an amusement by the way to pick up a shell or a flower. But your thoughts all the while ought to be directed to the ship, constantly watching for the call of the captain: and when he does call you, you must throw away all these things and hasten, that you may not have to be bound and thrown into the ship by others. So in life also if, instead of a flower or a shell, there be given to you a wife or a child, there is nothing to hinder you from taking them for your own. But if the captain should call, run to the ship and leave all such things behind you." "Especially," the old Epictetus adds with a touch of pathos, "if you are an old man, do not go very far from the ship, lest you should lose your passage." Epictetus, indeed, regards the life of absolute renunciation as an ideal, much in the same way that the medieval Church regarded the life of a monk 1Man.i § 7.
or a nun; but he did not expect, any more than that Church did, or than the Eoman Catholic Church does now, that every one should adopt such a life. He even earnestly warns off from it every one who has not a special vocation for such a life and who has not counted the cost. For all who have not this special vocation, he is content if, without renouncing relative goods, they should constantly remember that such goods are relative, and that the absolute good must never be sacrificed to them. Finally he bids them always remember that all outward things are in the hand of God, and therefore must be rightly disposed. In this respect the attitude of the Stoic is essentially religious; and what gives him strength to meet misfortune and bereavement, is not so much indifference as confidence in the divine power that gives and takes away. But there is still another aspect in which the Stoic modifies his conception of the indifference of all outward things. He is obliged to recognise that. action is particular, or that in each action we have to deal with a particular object. Our motive may be to realise the general idea of law or order, but in every special action we have to apply that idea to some specific end. Hence, though the inner attitude of the will be everything, yet it always is an attitude toward something external. This the Stoic is obliged to admit; and hence, while he maintains that virtue is entirely concerned with the general idea of law, and that a* good act in the full sense of the word (a Karopdcejtia) must be done entirely for the sake of the law, yet he has to allow that in each case there is a certain propriety (icaOrjKov) to be observed, though the observance of this propriety could not of itself make the act moral. From this point of view, the Stoic is fond of speaking ofr particular objects, in the treatment of which the good will has to be realised, as the materials of morality ; and he calls upon us to have faith that the right materials are always provided for us by divine providence. But what he most insists up6n is that the important thing is not the materials, but the way in which we use them. Hence he regards all human lots, whether fortunate or unfortunate in the ordinary sense, as nothing more than opportunities for the exercise of those moral qualities which in his view constitute the highest, and indeed the only absolute values in life. "What," says Epictetus, "are outward things? They are materials for the will, in dealing with which it shall attain its own good or ill. But how is it to attain to such good? By not being dazzled by the materials it works with, or confusing them with the good itself. For our opinions on this subject, when right, will make the will right, and when wrong will make it wrong. This law hath God established and declared: € If thou wouldest have aught of good, receive it from thyself/"1 Or, again, take this passage from the Manuali2 "Whatever happens to you, turn to yourself and ask what power you have to make use of it. If you see beauty, regard it as an opportunity to exercise self-restraint: if what comes to you be labour, you will find in it the material for your powers of endurance: if what comes be reproach, you will find in it the material for patience." •as the best opportunity or material for virtue, and to regard good fortune rather as a temptation. On the whole, however, the main lesson they press is that men should take what comes, and attach as little importance as possible to it, and as great importance as possible to the way in which it is used. Thus their last thought is expressed in the following aphorism, in which, as frequently, Epictetus compares the world to a stage. "Remember that you are an actor in a. play, and that the character of the play is fixed by the author and the stage-manager. If he wills that you should play the part of a poor man, see that you do it to the life: if of a lame man, if of a magistrate, if of a private person, it is all ona For it is your business to 1 Epict., Dissert., I, 29. 8 Jf<m., § 10.
slave or artizan does not come within Aristotle's scope; and he would certainly not have understood what Bacon meant when he said that "prosperity was the blessing of the Old Testament, but adversity the blessing of the New." Now the Stoics stand above Aristotle in one respect, namely, that as they break away from the limited ideal of the Greek State, and hold that the highest good of man is not dependent on the special environment of the citizen in such a State, or on the special forms of social life that were developed by it. But they go much farther than this when they maintain that all outward interests, even the interests of the social life in all its forms, are, from the highest point of view, indifferent, and that, indeed, from every point of view, such interests are to be regarded as unessential. Eor thus they are driven back upon the isolated inner life of the individual, and have to confine the absolute good to the bare state and direction of the will. Now the mistake of this negative attitude may easily escape notice, so long as it shows itself merely in treating wealth, or fame, or pleasure as indifferent; but when it leads the Stoics to deal in the same way with the ties of kindred and friendship, of family or nation, and to place virtue in obedience to an abstract law which is independent of all these, we begin to suspect some mistake or overstatement. And the mistake seems to be that, in spite of their identification of the reason that constitutes the nature of man with the divine reason which manifests itself in the universe, they do not realise that the consciousness of self as a moral being, and the consciousness of other selves as members of one society, are two factors that cannot be separated. In other words, they fail to recognise that the inner and the outer life are not two spheres of activity, but only different aspects of the same thing; and that if we fall back on the former to the exclusion of the latter, we deprive it of all its meaning. The whole contents of my thought, the whole interest of my feelings, the whole material of my desires, have reference to things and beings other than myself. Man, as Aristotle says, is " a social and political animal"; and to treat him as having an inner life of his own, which is complete in itself, or only stands in accidental relations to the things and beings without him, is to empty life of all its interests, and then to claim for the bare self—the blank form of self-consciousness—all the rights to which it is entitled just because its interests are as wide and comprehensive as the universe itself. And here, I think, we find at once the truth that Underlies the Stoic theory, and the point where it is deficient. The greatness of a self-conscious being, that which makes him an end in himself in a sense in which no other being is such an end, is his universal potentiality. His knowing faculty, as Aristotle saw, is not limited to any one kind of objects, but carries with it the idea of the universe as an all-embracing whole. Hence it cannot be entirely absorbed by any one impression or interest, or lose the power of bringing it into relation with other impressions and interests. Men may be limited and prejudiced, but, so long as sanity is maintained, their minds cannot be so occupied by any special objects or aspect of objects as to blind them to everything else, or absolutely to shut their eyes to the teachings of new experience. And the whole progress of culture and science is just the continual effort of man, prompted by his essential nature, to rise above partial views and impressions, and to see the world as a whole, without unduly emphasising any special aspect of it. In like manner, our moral life also is a continual effort after universality. For, in the first place, if we consider the manifold interests of the individual—all his activities of sense and intelligence, of appetite and desire—we cannot but recognise that each of them has only a relative value, and that that is an imperfect and lop-sided life, in which one of these interests is allowed to swallow up all the rest. Hence, if, at any special stage of our development one element seems all-important, yet, as life goes on, we are carried past it, or checked in our pursuit of it, by the necessity of attending to other elements, or by the discovery that the satisfaction of the ruling passion still leaves us unsatisfied. Thus the lesson of experience is that the life which will satisfy the self must be complex and full: nay, that it must find a place for all interests in due proportion. Nor, again, can we avoid looking beyond the individual life to the wider whole of which it is a part. No one can entirely escape the necessity of seeing his own life from the point of view of the society to which he belongs; of recognising the claims of its other members upon himself, and feeling that ^ he has done wrong, if he has treated these claims in4 a quite different way from his own. The individual has, of course, a bias in his own favour; but he recognises the wrongfulness of unsocial action in the case of others, even when he tries to excuse it in himself. It is this potential universality of interest which makes man capable of a social life that goes beyond the herding of animals, and which in the progress of history gradually widens and deepens the conception of his social duties and relations. All moral progress, indeed, is bound up with this widening of the claims of man upon each other and the deepening of their ideas as to the character of these claims, as claims for each individual, not only to life and its elementary blessings, but to all the share he is capable of taking in the great heritage of humanity, in all the interests, lower and higher, of its manifold existence. years of age, if he has any understanding, has in a manner seen all that has been and all that is to be, Another property of the rational soul is the love of neighbours, coupled with truth and modesty and that supreme self-reverence which is likewise an attribute of universal law. the law or reason which is one with the law of justice." In such a passage we see a recognition of that universality of man's mind and will, of which I have spoken, his capacity for embracing the whole in his thought, and of identifying his will in action with the principle that is realising itself in that whole. Butr we see also that Marcus Aurelius takes that principle abstractly, as a principle manifested, indeed, in everything, but not as a principle that binds all things into a system, and connects all the successive stages of their history as parts or phases in one evolution. The Stoic sees that man's knowledge cannot be confined to any one object or class of objects, nor his desire and will to any one particular interest. He sees, also, that there is no one interest which he may not be called upon to sacrifice to the good of the whole, or to the realisation of that principle on which the whole rests. But, admitting the truth of all this, it does not carry with it the consequence which he seems to draw from it—that these interests in their totality are indifferent, and that the inner life is all in all. For the very ends or goods which the individual is required to sacrifice in view of the whole are all elements in that whole; and if, one after another, we reject and renounce each and all of them, the whole must disappear. We might put this in the conversational manner by which Epictetus often tries to give point to his lessons. We might suppose the Stoic to ask the question, ' Is not every finite object capable of coming into collision with the universal law, and so of standing between us and our duty?' To this we are forced to answer, ' Yes.' 4 Is not, then, each such object indifferent, in the sense that its attainment cannot be weighed against the necessity of doing our duty ?' To this again we should have to answer,' Yes.' But the Stoic goes on, f Is it not, then, true that all outward objects, that is, everything but the good will must be regarded as a mere material of life, which has no good in itself but only in the way it is handled? * Here we should be obliged to answer with a distinction. If it be meant that the good of life lies in the good will as a mere internal state of the subject, and not as the realisation of man's moral capacity in the family, in the State, and in all the various social relations into which human beings enter with each other, then we must answer, 'No.' To talk of a TroXmla tov kqcjulov, a union of all rational beings with each other, is to utter a mere wish or #ream of good, if this idea of universal community is not to be worked out in detail, and to lead to a reconstitution- of all the particular relations of society. And to say that the latter is indifferent and the former essential, is like speaking of an 'Invisible Church/ in which all religious men are united, while remaining content that all the branches of the visible Church should be at war with each other. At the same time, it was something that even the idea of such a universal community should be set forth as truth. It was something to direct the thoughts of men to a great idea, although the form it took was unpractical, and even impracticable. If it- did nothing else, it at least set aside all lower aims as unsatisfactory, and prepared the language in which the universal conceptions of Christianity could be expressed. And this leads me to say, in conclusion, that the Stoic philosophy was in its very essence a movement of transition, a connecting link between two stages of moral progress. It was primarily the negation of a past phase of life; and it would have been barren, if it had not pointed forwards to something more positive than itself. What it really showed was, not that men could realise a moral life in themselves without any effective social bonds to unite them to each other, but that the old bonds of society, the bonds of race and nation, had ceased to be effective, and that the only possibility of their renewal lay in the realisation of the deeper principle of humanity. We may, therefore, fairly regard Stoicism as a recoil of man upon himself, whieh showed that his institutions had become inadequate to his growing life, and at the same time indicated that the only basis upon which they could be reconstituted was the unity and equality of mankind. Nor must we forget that it directly connected its consciousness of the unity of humanity with the idea that the same reason, which makes the individual man a self, is also the absolute principle revealed in the whole system of the universe.